In recent years the increasing availability of High Performance Computing (HPC) resources strongly promoted Large Eddy Simulation (LES) as a viable approach to the simulation of those moderate Reynolds flow conditions where Reynolds-averaged Navier–Stokes (RANS) formulation fails, e.g. massively separated flows. In particular, the practice of an implicit LES (ILES) based on the Discontinuous Galerkin (DG) method showed to be very promising due to the favourable dispersion and dissipation properties (Bassi et al., Eur J Mech B-Fluid Part 2 55:367–379, 2016, ). The high potential of DG approximations for the under-resolved simulation of turbulent flows has already been demonstrated in literature and research on this topic is growing fast (Chapelier, et al., Comput Fluids 95:210–226, 2014, , de Wiart et al., Int J Numer Methods Fluids 78:335–354, 2015, ). 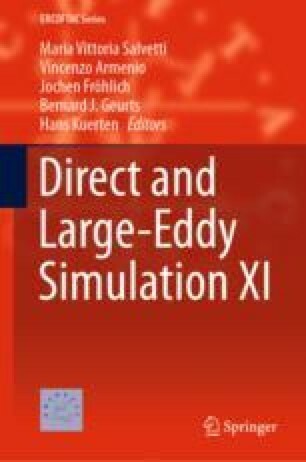 However, how to integrate in the most efficient way the semidiscrete set of NS equations exploiting at best such large computational facilities is an active research topic.